I came across this fun twist on cheesecake at Real Mom Kitchen. They are just the right serving amount. They would be perfect for a kid's birthday party. I made them for my mother-in-law's birthday, and they were a hit. Cream the cheese and sugar together. Add eggs and lemon juice. Beat until smooth. Line cupcake pan with liners. 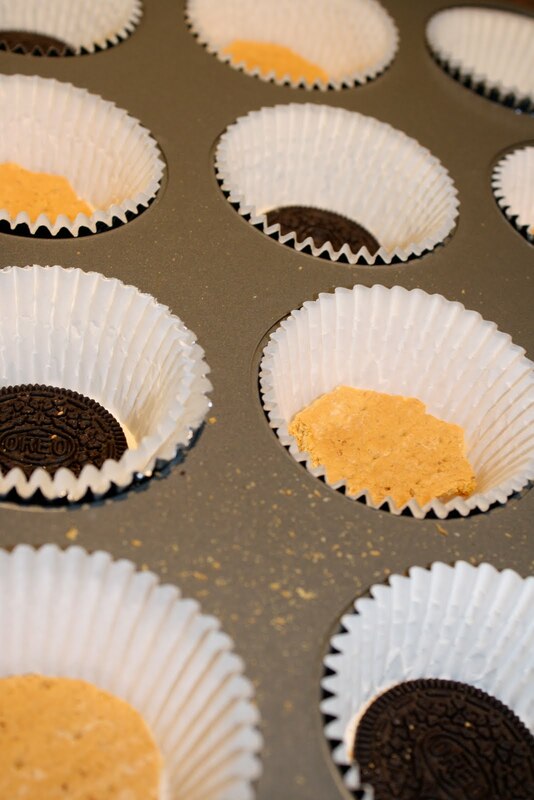 Scrape the filling off the oreos. Place oreos and/or wafers flat side down in each liner. Fill liners 3/4 full with cream cheese mixture. Bake for 6 minutes. At this point I added the fruit or chocolate to the cheesecakes (4-5 blueberries or 2-3 raspberries or 4-5 chocolate chips. If adding chocolate chips, swirl them around in the batter with a toothpick). Continue baking for 9-14 minutes or until golden brown. Allow cheese cakes to cool and store in the fridge. Before serving, I topped them with 3 blueberries, 1 raspberry or 4 chocolate chips, depending on what I had added to the batter (my daughter had fun topping them). You could also top these with pie filling before serving (can also be frozen prior to topping. To serve, thaw and top with fruit, chocolate chips or pie-filling). Made 20. So good! Real Mom Kitchen also provides a Turtle Variation that sounds awesome. Lastly, a special hello to fellow Friday Followers! These are SO cute!!! Would be great for a tea party! I heart cheesecake!!! These look so super cute and tasty! Love it! I am going to have to make these! Thanks for dropping by! I am excited to be your new follower! Mini cheesecakes are perfect canape desserts for parties. Hi! Glad to find a fellow foodie thru FF. Following you now thru Friday-Follow! Hope you could follow through, drop by and and say hi!! I am in love with your blog!! So happy to have found it! I'm your newest follower from Friday Follow! They are so cute! I love it. This is nice to be paired with a cup of tea. Following you from FF, please follow back! Looking forward to reading your blog!